Because you can never have too much Cumberbatch. I felt this post was necessary because Benedict Cumberbatch is amazing. And gorgeous. And talented. Cool, funny, etc, etc. He's gained a lot of popularity lately due to his roles in Star Trek Into Darkness and BBC's Sherlock. Apparently I am a huge nerd. And that shows when it comes to this man. I have been telling people about the new Star Trek movie for ages, it seems. 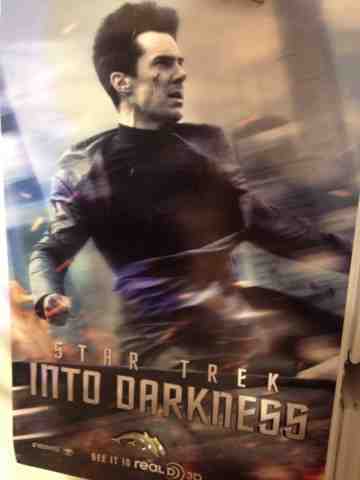 And the main reason for my excitement was, of course, Mr. Cumberbatch. I was shocked and appalled to discover how few people knew who he was. As part of the Nerd World, of course I have known about him. And if you haven't seen BBC's Sherlock, you really need to. Cumberbatch is brilliant in that show starring alongside the wonderful Martin Freeman. So apparently he hasn't made as much of a name for himself in the US outside of certain groups. Shocking, I know. Here are some awesome Cumberbatchy tidbits for you all to enjoy! A little poster that Isaac brought home for our enjoyment! My enjoyment? Anyway. STIDJunket_TrekOrFalse_h264. This will cause some other related links to pop up--namely other interviews that are fun to watch as well. And if you aren't familiar with Tumblr, you'd better get on that! There are so many great Cumberbatch-related pictures, gifs, and memes! It's glorious! There is a link to my Tumblr here and some of the people I follow find the best stuff. Yumm! Please feel free to share your favorite Cumberbatch pictures, videos, quotes, etc! Like I said, there is always room for more! And apparently we need to get his name and handsome face out there so people don't look at me like I'm nuts when I mention his name. *Sigh* He is so dreamy. And a very talented actor! Have you seen Warhorse? Did I mention he's dreamy? He's also single. And I'm single ... Do you think he'd like an Australian girlfriend?